We have to hand it to our big-sibling weekly newspaper, The Reader. They’ve discovered an errant street sign in Ocean Beach. Or rather their new guy, Dave Rice – who also is one of our bloggers -, found it. It’s a street sign of the new, blue type that the City has been installing for a while now. 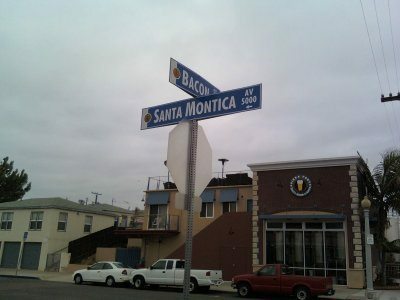 But this one, at the corner of Santa Monica Avenue and Bacon Street …. is misspelled. It’s spelled “Santa Montica” instead of … well, you know. I used to live on Santa Monica and I take special affront from this botched street sign job. But more than that. Santa Monica Avenue is very important to the OB community, as it holds our town center, the OB Library, the US Post Office, our local elementary school, the OB Rec Center, and at its foot is the central HQ of our local lifeguards. Hey Sam Deiggo! Get it straight! We call him “eagle eye” Dave. dave – you noticed? had a friend who regularly pasted “green B’s” up on the longbranch signs. now, do they need to switch to blue? hey people! where’s my freakin avatar? Hey bob, when you post under another email address it won’t show up until you let us know you’ve changed it and we can update your profile. All fixed now! You don’t see the people in Santa Montica, near Ventice, complainting. This is what happens when we lay off teachers and librarians. If I was about 40 years younger I’d hitch-hike the 2500 miles home to OB and take that sign down and return it to public works or where ever it came from. Seriously!